The cake isn’t actually levitating; it’s just on a cooling rack. But it would be cool if it had metaphysical powers. I love Everyday Food; it’s my current favorite foodie mag. I especially love their “Sweet Favorites” section, which features reader submitted favorite dessert recipes.I had a sweet craving after dinner last night, so I thought I’d whip up this month’s Sweet Favorite: Sour Cream Pound Cake. It’s a simple recipe — really just throwing things in a mixer, and then into the pan. But the final result is … eh. Not great, not bad just … eh. It’s got pleasant vanilla flavor but it’s not particularly rich or buttery. It does weigh a lot, but that doesn’t come across in the flavor. Certainly, I may have screwed something up. Shortly after I added the first egg, the batter looked “broken” — you know, that separated, curdled look. If I recall correctly, that happens when you over beat the butter, but I don’t think I did. The recipe says it should take 75 to 85 minutes to bake but by that point, my cake was still soupy inside. I finally took it out after 107 minutes, and it remained damper around the ring than I would have liked. (I could have left it in the oven, but I was losing patience by that point.) I also baked this in a silicone bundt; could that have impacted things so dramatically? If you make it, let me know how yours turns out. I’d like to compare notes. Preheat oven to 325-degrees. Butter and flour a 10-inch tube pan (though it’s clear from the magazine’s photo they used a decorative bundt). In a medium bowl, which together flour, baking soda and salt; set aside. In a large mixing bowl, beat butter and sugar until light. Add eggs one at a time, beating after each addition. Then add vanilla and beat until well combined. With mixer on lowest speed, add flour in three parts and sour cream in two, beginning and ending with the flour. Beat after each addition until just combined. Spoon batter into prepared pan, smoothing top with a rubber spatula. Tap pan on counter to let batter settle. Bake until a toothpick inserted in center comes out cleat and cake is golden brown, 75 to 85 minutes. Let cool in pan for 20 minutes, then run a metal spatula around the inner and outer edges of the pan. Invert onto a cooling rack and cool completely. Sorry it didn’t turn out as well as you expected. 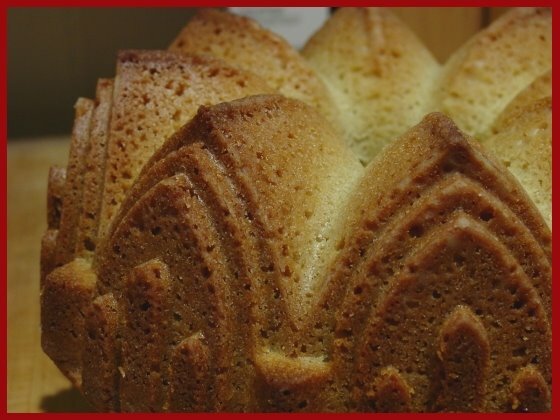 But I love, LOVE your bundt pan! May I ask, where did you get it? Lis– Total fluke. I’ve seen similar, metal ones at William Sonoma for $20-$25 but I got this silicone one for $4 (!!) on sale at WalMart.